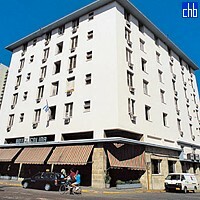 Hotel Isalzul Colina should appeal to anyone visiting Havana looking to party & have fun with local people, with a perfect location in the heart of the city. Colina hotel may be a basic 2-star hotel but its location & the warmth of its staff will provide a memorable experience before you even step outside to enjoy the area’s restaurants, bars, markets, museums & shops. Colina serves good food from both a 24 hour snack bar & buffet restaurant, with drinks served in the lobby bar. 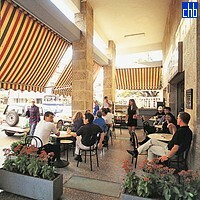 There is also a nice outside terrace where you can relax in the shade of a colourful awning & watch the bustling city around you. The noise & partying both outside & inside means this hotel is suited to younger travellers who want a good time at lower cost. But whatever your age, if you want great service, don’t mind the noise & want great access to Havana’s central attractions, you won’t find many better hotels than Colina. 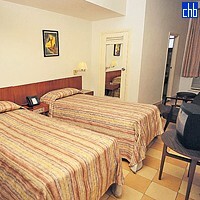 The rooms are clean, colourful & reasonably maintained, although the bathrooms are small with gaudy colours. However, this is a comfortable 2-star hotel & the 80 ensuite rooms are adequate, with double or twin beds, satellite tv, safe & air-conditioning.